Lily’s aluminum can houseboat – though it kind of seems more like a pontoon boat, doesn’t it? I’m ending 2013 with a bald confession: I’m a feminist, and yet my two young daughters, ages 5 and 2, play often with Barbies (particularly in the bathtub, for some reason); they adore Barbie and Disney movies; they like the colors pink and purple; and they eat many of their meals on Disney princess plates. Does this make me a failed feminist mom? Aren’t I worried about the potentially corrosive effects of conventional, “traditionally” gendered media/toys? A little. Sometimes. But frankly, not really. Because my daughters also like playing with Legos, and Lincoln logs, and marble raceways, and face paint; and they like watching “Word Girl” and “Wonder Woman” and “Pippi Longstocking” (and Lily’s currently addicted to hearing Nancy Drew chapters read to her each night); and they like all kinds of different colors, not just pink and purple. 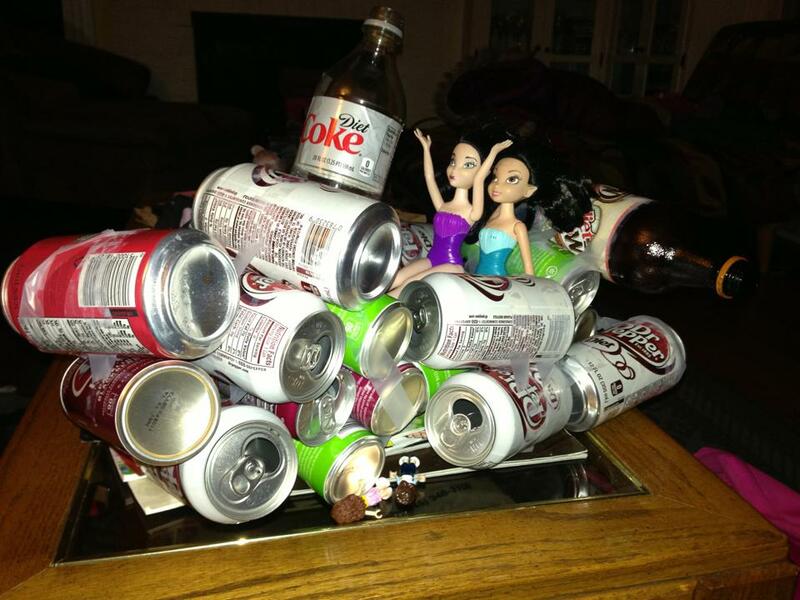 Plus, something that happened this past weekend only strengthened my resolve to keep encouraging my daughters to play freely with what they want, in the way they want: Lily, my 5 year old, collected aluminum cans from our recycling bin and went on to build – with mounds of masking tape, of course – a houseboat, upon which she seated two of her Barbies. I couldn’t have asked for a more salient metaphor.